Pure drinking water is the most important and essential needs that should be available to every living soul on the planet. Pure drinking water helps in staying fit and healthy all life. Water purifiers make the purifying task easier than boiling the water. There are some best water purifiers under 5000, which is completely under anyone’s budget. We cannot avoid the use of pesticides, fertilizers, water treatment or any other unnatural method that are making the groundwater harder every day. This water passes through the pipes and tanks that have a lot of bacteria and viruses inside. Hence, you need to clean these bacteria with the help of water purifiers that gives 100% safer drinking water. Buying a good water purifier will be a one-time investment. Hence, you need to choose the right purifier worth your money and as per your needs and requirements. Kent is a very well-known brand which is mostly preferred by the Indian homes. Ultra is one of the bestselling water purifiers in the Indian market. The purification process has six stages that the input water has to pass, to become fresher and healthier. The purification stages include activated carbon filter, sediment filter, and a UV bulb. The stage of the purification includes removal of all the dust and sand substances from the water; the activated carbon ensures that the water is free of chemicals and other unnatural treatments, and the UV bulb kills and eliminates the bacteria and viruses that are present in the water. The UV bulb has to be changed when it’s prompted. Otherwise, it would stop functioning. 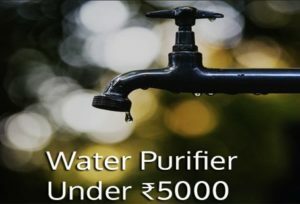 It is better to buy a high-quality purifier under a budget as it is one of the best water purifiers under 5000. Whirlpool is another brand that is yet famous for its home appliances products. The brand has again come up with a non-electric water purifier with an EAT technology. Destroyer has a storage capacity of 6litres, and it can be easily installed by you. You don’t have to call upon an executive to fix the purifier. Destroyer can kill and control up to 500 ppm of TDS levels in the input water. It is integrated with the five-stage water purification method that includes EAT filter, Pre-filter, and Mechanical filter. The electro Adsorption Technology also is known as EAT can remove germs, bacteria, cysts, and viruses that are present in the water. One of the best things about Whirlpool destroyer is there would be no wastage of water, and you would not require electricity to make the purifier work. It is an ideal choice for every family. Kent smart is the most preferred model by many Indians. Smart doesn’t need any electricity to work on. The purification technology is completely integrated with Ultrafiltration also known as UF technology. UF technology easily removes the dissolved salts from the water making it pure and safe for drinking water. Smart can store up to 7 litres of purified drinking water. Kent smart is made up of ABS plastic (non-breakable plastic) which is very simple to mount over the wall. The tank can be easily removed for cleaning. Kent is leak-proof and is completely automatic. Water purifiers have become a basic need. Water that you get from your home taps and tanks might not be clean. 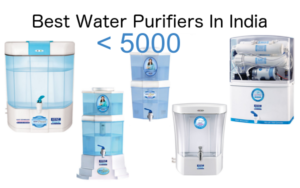 Hence, these water purifiers under 5000 will purify and make it more clean and pure. You can also check out Water Purifier with hot and cold water dispenser and more.